In late summer 1940, as war spread across Europe and as the nation pulled itself out of the Great Depression, an anticommunist hysteria convulsed New York City. Targeting the city's municipal colleges and public schools, the New York state legislature's Rapp-Coudert investigation dragged hundreds of suspects before public and private tribunals to root out a perceived communist conspiracy to hijack the city's teachers unions, subvert public education, and indoctrinate the nation's youth. Drawing on the vast archive of Rapp-Coudert records, Bad Faith provides the first full history of this witch-hunt, which lasted from August 1940 to March 1942. Anticipating McCarthyism and making it possible, the episode would have repercussions for decades to come. In recapturing this moment in the history of prewar anticommunism, Bad Faith challenges assumptions about the origins of McCarthyism, the liberal political tradition, and the role of anticommunism in modern American life. With roots in the city's political culture, Rapp-Coudert enjoyed the support of not only conservatives but also key liberal reformers and intellectuals who, well before the Cold War raised threats to national security, joined in accusing communists of "bad faith" and branded them enemies of American democracy. 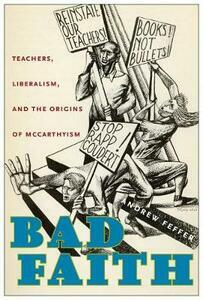 Exploring fundamental schisms between liberals and communists, Bad Faith uncovers a dark, "countersubversive" side of liberalism, which involved charges of misrepresentation, lying, and deception, and led many liberals to argue that the communist left should be excluded from American educational institutions and political life. This study of the Rapp-Coudert inquisition raises difficult questions about the good faith of the many liberals willing to aid and endorse the emerging Red scare, as they sacrificed principles of open debate and academic freedom in the interest of achieving what they believed would be effective modern government based on bipartisanship and a new and seemingly permanent economic prosperity.